Rip, the school bookie, who sets the odds…. And Noah, The Boy. The one who changes everything. I’ve been wanting to read another Levithan book since I read The Lover’s Dictionary. While I was at the library, I grabbed this and another Levithan book on the shelf. I was also hoping to read a book about the experience of gay teens and young adults. I haven’t read one since Absolute Brightness (which I need to re-read, so I can properly review it, but I remember it being exquisite!) by James Lecesne. I’ll admit, I almost gave up on this book because it was so far outside of what I was expecting. It’s not really a spoiler since it says it right on the back of the book (which I didn’t carefully read), but Paul’s world is not really like our world. His school is populated by openly gay, lesbian, and bi characters. There are even characters who cross-dress. And nobody makes fun of them. There is none of the homophobia one would expect in a novel about teens outside the status quo. If you think about it, it’s kind of sad that that was the reason I almost gave up. Because it was too idealized. Because it looked too much like how the world should be. In the novel, the only characters who display any sort of homophobia, are Tony’s super-religious parents. I could dissect that as well, but I won’t. 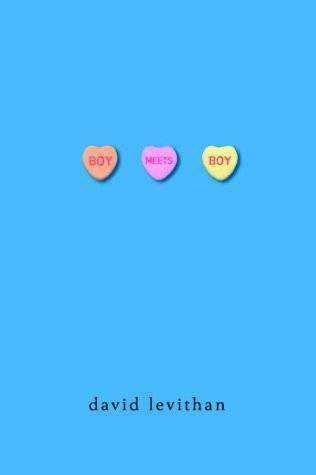 Suffice it to say, Boy Meets Boy isn’t your average book. Once I got past the initial shock of Paul’s world, I was hooked by Levithan’s unique story-telling voice. Like his compatriot, John Green, Levithan knows how to create vivid characters. And to make first love appear every bit as poignant as we remember it to be. As The Lover’s Dictionary was written for adults, this novel lacks a lot of that particular brand of charm. But where Levithan waxes poetic, one could easily decry it as melodramatic. Or, you could roll with it. As I did. And it’s beautiful. I won’t spoil the ending, but I will say that, contrary to this utopia-land Levithan drops us in, not everything turns up rainbows. Not everyone is happy or satisfied at the end. Not every relationship is repaired. Which makes this novel all the more delightful. The collision of idealism with realism. Have any of you read it? What did you think? I was surprised I liked it as much as I did—I could easily have seen myself swinging the other way. like tony. paul even says that their initial meeting (on the aforementioned trip to the strand, and the train ride back) typically would have kicked off a romance, “but I think we both knew, even then, that what we had was something even more rare, and even more meaningful.” tony and his family serve as a sort of anchor for the book, tethering paul’s wonderful whimsical open-armed town to the real cold horrible world, a message to the reader that levithan is hardly naive and a reminder to paul that he has it really lucky, even though what he has should be the bare minimum. tony reminded me of ricky in my so-called life — the ever-patient friend who always gives and always understands and never asks, because no one can give him what his life is missing, what he needs and deserves so badly — but i appreciated that the book engaged with his sad wisdom more directly. watching tony try to shape his relationship with his parents, try to stand his ground in some ways while genuinely not wanting to hurt them (as he sees it and explains it to paul, they don’t want to hurt him either; they truly think the best thing they can do for him is keep him out of the fires of hell), is maybe the most moving part of the book.